If you’re like the majority of runners or cyclists out there, chances are you have experienced all kinds of aches and pains in your day, especially knee soreness or pain at some point. 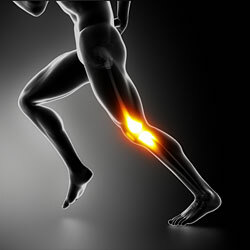 Knee pain can range from irritating to debilitating. You might notice tenderness that goes away with rest and icing, but you might develop more severe symptoms including swelling and persistent pain that keeps you sidelined. You may feel pain not only during exercise, but any time the knee is in a flexed position, such as when going up or down stairs. If the site of your pain is the outside of your knee either right above or below the level of the kneecap, multiple causes are possible, however, the pain is likely being generated by your iliotibial band. IT band pain and soreness is especially common in runners and cyclists due to the impact of running and the repetitive nature of the movements in both running and cycling. People who are on their feet for long periods of time are at risk as well. If you have a job that requires lots of standing and then you hit the track or the bike to get your cardio workouts in, you are doubling up on risk factors. Keep reading to learn more about the structure and function of the IT band and the underlying causes of IT band friction syndrome. The IT band goes by a couple names, most commonly called the iliotibial band or the iliotibial tract. It consists of a tough strap of connective tissue originating from the front crest of your hip, running down the outside of your thigh, and inserting into the top of your tibia, which is the larger of the two shin bones. Since the prefix “ilio-” refers to the hip, while “-tibial” obviously refers to the tibia, and the structure itself resembles a long flat band, the name iliotibial band makes good sense. If you feel around on the outside of your knee, that thick strap running alongside your kneecap is the end of your IT band. How Does the IT Band Work? The IT band is just tough connective fibers, not actually a muscle itself. As such, it requires a muscle to produce movement. 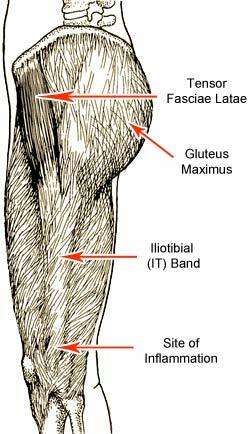 The main muscle responsible for controlling the IT band is the tensor fascia latae (TFL), a short but powerful muscle originating on the front of the hip and inserting into the IT band about one third of the way down. The TFL and IT Band together aid in hip flexion (raising the knee toward the abdomen) and hip abduction (raising the leg laterally away from the center line of the body). The gluteus maximus muscle also inserts into the IT band, so contraction of the gluteus maximus affects the movement of the IT band as well, preventing the knee from excessive internal rotation. Tight tensor fascia latae. Tightness can be reduced with stretching and self-myofascial release. IT band tightness and/or adhesions. Self-myofascial release helps relieve tension and break up adhesion. Weak glutes and hip muscles. Add gluteus maximus, adductor, and hip flexor strengthening exercises to your strength training routine. Inadequate quadricep development. Strengthen your quads as part of your strength training routine. Overpronation of the feet. Use supportive inserts to prevent your arch from collapsing, which misaligns the knee and ankle. Environmental factors. Most roads and tracks slope to one side. 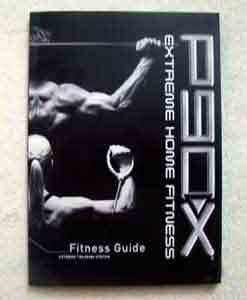 Vary your route to more evenly distribute impact to both sides of the body. Although IT band friction syndrome is a common cause of side of knee pain for runners and cyclists, there are other injuries that may be co-occurring or occur in isolation which mimic IT band syndrome symptoms. These issues include lateral meniscus tears, articular cartilage lesions or arthritis. See a doctor immediately if pain is severe or persistent. Do you want to learn more about how to prevent and treat IT band syndrome? 3. Delavier, F. (2001). Strength training anatomy. Paris: Human Kinetics.